A parliamentary report of 1777 recorded parish workhouses in operation at Ashton Keynes (for up to 20 inmates), Cricklade St Sampson (40), Liddiard Millicent (10), Lyddiard Tregooze (20), Purton (30), and Wootten Bassett (40). 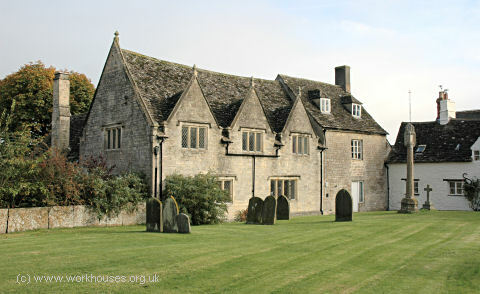 A building backing onto St. Sampson's churchyard in Cricklade was converted for use as the parish workhouse in 1726. A master's house was added at its eastern end. It was originally built as a school in 1652 by Robert Jenner, a City of London goldsmith and MP for Cricklade. It subsequently reverted to use as a school until as recently as 1960. Cricklade former parish workhouse and master's house (right-hand portion), 2005. 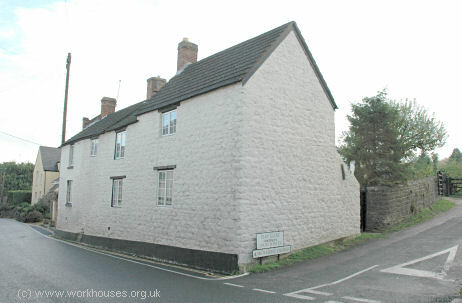 A house at the eastern end of Purton High Street was also used as a poorhouse. County of Wiltshire: Ashton Keynes, Braydon Tything, Clyffe Pypard, Cricklade St Mary, Cricklade St Sampson (2), Elsey, Latton, Leigh, Lydiard Millicent, Lydiard Tregoze, Lyneham, Purton (2), Tockenham, Wootton Bassett (2). Later Additions: Broad Town (from 1884), Marston Meysey (from 1882). The population falling within the Union at the 1831 census had been 10,275 with parishes ranging in size from from Braydon Tything (population 64) to Wootton Bassett (1,896). The average annual poor-rate expenditure for the period 1833-35 had been £11,948 or £1.3s.3d. per head of the population. 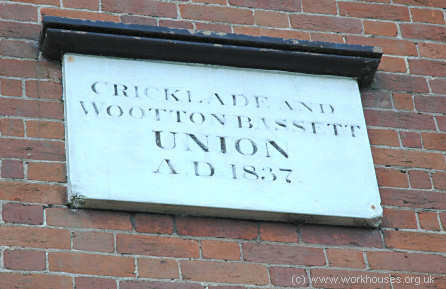 The Cricklade and Wootton Bassett Union workhouse was built in 1837 at Purton. The Poor Law Commissioners authorised an expenditure of £3,750 on construction of the building which was to accommodate 200 inmates. It was designed by George Wilkinson who was also the architect of many other workhouses including Wiltshire ones at Malmesbury and Devizes. His design for Cricklade and Wootton Bassett was based on the model cruciform or "square" plan published by the Commissioners in 1835. It included an entrance and administration block at the north, with the rear ranges arranged in a cross to create separate exercise yards for the different classes of inmate (infirm/able-bodied, male/female). The site location and layout are shown on the 1923 map below. Cricklade and Wootton Bassett site, 1923. In the 1930s, the workhouse became North View Hospital and provided care for female 'mental defectives' — mentally handicapped women. 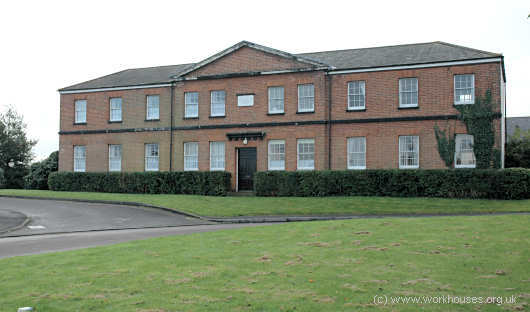 Only the entrance block of the workhouse survives and is now used as a doctor's surgery. Cricklade workhouse from the north-west, 2006. Another unusual survivor of the Purton workhouse is a set of metal stamps bearing words such as "MALE", "RECEIVING", "INFIRMARY", "MASTER", "OLD" and do on. Exactly what these were used to imprint is still a mystery. Workhouse office stamps. Courtesy of Waterperry Gardens museum. © Peter Higginbotham. In 1914, the Cricklade Union established a children's home in a house on Restrop Road that became known as Red Gables. Its location is shown at the far left of the map above. The home, which could accommodate 16 children, was later taken over by Wiltshire County Council. It finally closed in 1997 and the building has now been demolished. Wiltshire and Swindon Archives, Wiltshire and Swindon History Centre, Cocklebury Road, Chippenham SN15 3QN. Few records survive — holdings include: Guardians' minutes (1839-1930, with gaps); Indoor relief register (1913-16); Deeds etc. (1836-1930); etc. The Workhouse of Purton and Cricklade and Wootton Bassett Union by Alec Robbins (Purton Historical Society, 1992).